Even though Mood Fabrics is a 3+ hour drive from my house I make the trek when I need garment fabrics. You have more than likely checked out their website, so you know there is a huge selection (and even more in person! ), but what really keeps me coming back is the customer service. The last two times I have been lucky enough to be helped by Silvana, she is amazing! Seriously, if you are ever there make sure you ask for her. She was so patient even when I asked a million questions, helpful, knowledgable, and fun to talk with. Silk in a wild print. 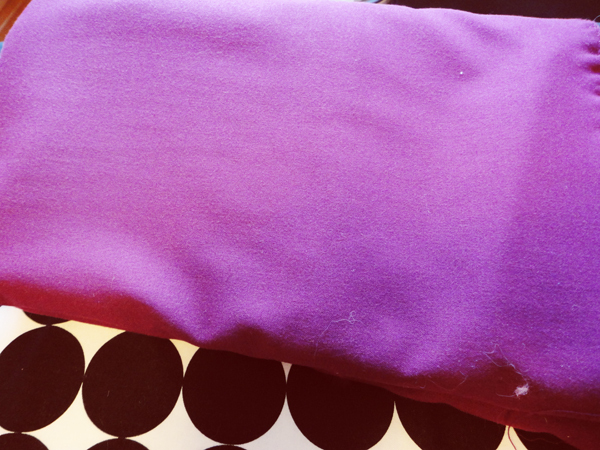 This fabric is actually more of a wine color. I messed with the settings in Photoshop, but still couldn't get the correct hue :( The polkadots are my ironing board, fyi. Another wild fabric. 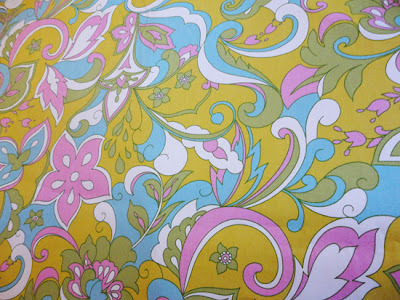 I've been super into fabrics that have a sixties feel to them, so I immediately fell in love with this one. 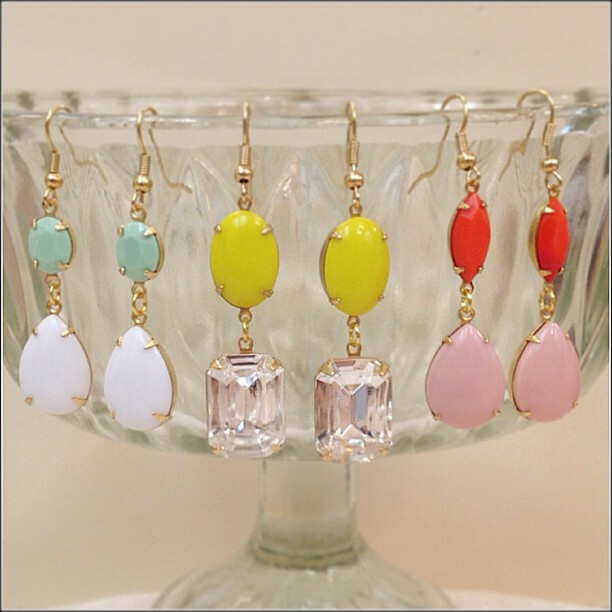 Yesterday my talented friend, Taryn, posted this photo on Instagram of earrings that she made. Ummmm, match made in heaven for the fabric I posted above? I immediately bought the two pairs on the right. Do you ever plan what you're going to wear with outfits that don't even exist yet? haha :) If you're like me and need jewelry for imaginary outfits (or real ones!) then check out her Etsy shop, you will not be disappointed. Loooove the fabrics!! Those are so neat! I can't wait to see what you make, the earrings will match beautifully. Those are some great fabrics! I love the 60's pastel Pucci like gem. The dogs are so cute together, can't wait to meet Oscar! Ooh! I love the pink silk print! GREAT fabrics!! I've been loving all things purple lately so that solid 'wine' is really calling to me - but hands down my favorite is the wild sixties-ish print! 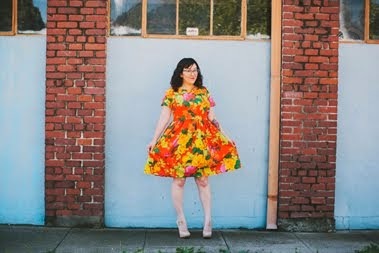 I think I kind of love you in bold prints! I saw Oscar when I was there too! He's so cute. Love the silk print. Can't wait to see what you do with it. Frankie even got to go to Mood?? So jealous ;) Looks like a successful shopping trip--can't wait to see your makes. I'm digging the 60's vibe on you! I'm about 45 minutes away from Mood (on a good traffic day, if that exists) but I still haven't gone inside. I've passed by it on occasion, but always on the way to dinner or another appointment. :( Granted, it's only been 11 months since I started sewing, but I really should see it in person! Such perfect fabrics and earrings for you!! 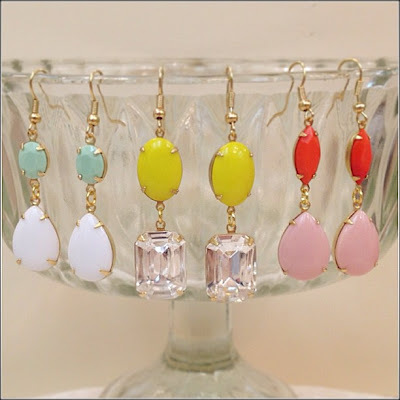 I don't usually like dangly earrings but these are really pretty! Especially the yellow ones! The sixties fabric looks really fun. Can't wait to see what it becomes. Perhaps a funky little shift (hmmmm new Collette?)? I seriously can't wait to see those amazing prints sewn up! Both have a great almost psychedelic vibe! I'm not a dangly earring person AT ALL, but these earrings converted me. You should plan a day trip there. Just bring a list of what you need or it might get overwhelming! I want to go back with you!!! We should do a meet up one day and meet there! 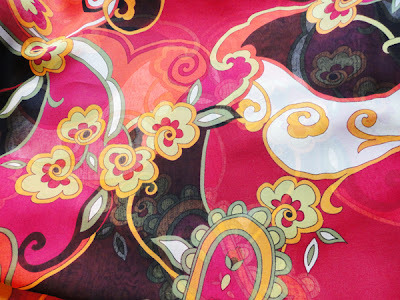 I lurve that second wild print you're going to make the Elisalex from - so very pucci! I couldn't decide what to get-- I favorited basically every bracelet! What a great shop!